Looking for some cool parks to shred in Nebraska? The state is home to a variety of expansive outdoor skate parks as well as a few indoor spaces fitted with cool elements to nail just about any trick. No matter your level of experience, all are welcome at these eight great skate parks in Nebraska. The Apollo Skate Park in Kearney, Nebraska, is one of few concrete parks in the area. Perfect for skateboards as well as roller skates and inline skates, this 10,000 square-foot park is the ideal spot to hang out for a few hours and practice. The park boasts a four-foot, five-foot, and six-foot quarter pipe, as well as a China wall, stair rails, spine, rollers, and a mini ramp. Apollo Skate Park is open from sunrise to sunset and is free to the public. This relatively new skate park located in Norfolk, Nebraska is open for skateboarding, inline skating, and BMX bike riding. Located in Memorial Park, it features bleachers for watching, a restroom, and even a lockable skateboard rack. Perhaps one of the most popular skating spots in Omaha, Nebraska, the Roberts Skate Park attracts beginners and experts alike. This prime spot features a few bowls, a snake run, and even a street course with a quarter pipe, banks, ledges, flat rails, and more. The park takes up a whopping 14,00 square feet and is designed with unique silhouettes of skateboarders at the entrance in honor of Mathew Kress and Tommy Craft, two pioneer skateboarders who pushed for parks to be welcomed in the city. Located in Grand Island, Nebraska, this skate park was designed with the help of area teenagers and covers 14,200 square feet. The park features an area for beginner skateboarders, which includes a mini-half pipe. In the advanced area, park-goers will find a launch box, bank ramp, wall ride, quarter pipes, two pyramids, and a street spine. Located in Arbor Park in Lexington, Nebraska, this skate park boasts a 100-foot by 90-foot concrete surface with many features. 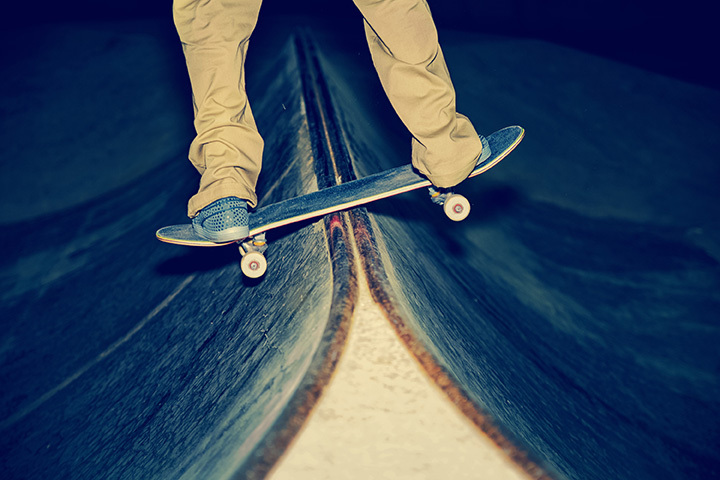 Skateboarding enthusiasts can enjoy a 20-foot half-pipe, a bank ramp, pyramid, skate table, tall box, rails, and three quarter-pipes. This skate park located in Aurora, Nebraska, is one of the few parks in the state that features movable “skatewave” pieces, meaning the park layout may be different each time you visit. Features include banks, launchers, and a great box for grinds and manuals. This is a great park to spend a couple of hours. The Vault is Omaha, Nebraska’s only indoor skate park and one of the only indoor facilities in the state. The Vault is dedicated to growing the skateboarding and BMX community in the Midwest and this popular hangout is a great place to visit year-round. The Bay is an impressive, non-profit skate park located in Lincoln, Nebraska. In addition to its indoor skating area, The Bay hosts an art gallery, concert venue, and a coffee shop. Whether you’re feeling artistic, or just want to listen to music and hang out with friends, The Bay is the best alternative to riding in the streets.